Knowledge of when not and hownot to do Kegel exercises is as important as knowing the correct circumstance and method. 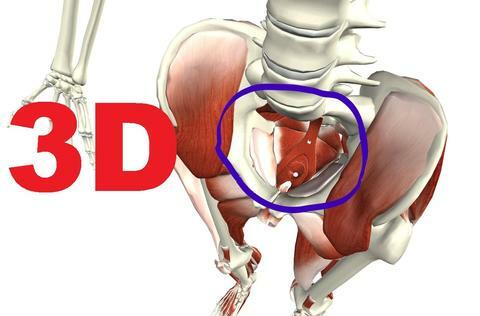 In order to gain a better understanding, let’s get familiar with what the pelvic floor looks like and the job it does. A “sling” of three muscles (collectively known as the levator ani) is what we train when doing pelvic floor exercises (PFEs) or Kegels. The muscles act like a retaining wall for the uterus, bladder and bowels in women, bladder, bowels and prostate in men. It should not be slack like a hammock. For most, we may simply have pelvic floor weakness that requires coached PFEs for continence, organ and structural support and sexual health. However, certain situations call for a different approach to pelvic health. “For those who have a hypertonic (abnormally high muscle tone) pelvic floor Kegel training will be more of a “reverse Kegel”, an awareness of down training, allowing the muscles to relax and lengthen” recommends Karen Liberi. * Certain diagnoses of pelvic pain like Vaginismus (the involuntary contraction or spasm of the pelvic floor muscles) would also require muscle relaxation techniques. A multi-faceted approach can be dilation and/or massage partnered with instructions as to how to improve pelvic floor functionality to promote pain relief. A traumatic event or surgery, can cause nerve irritation. IKegel exercises may be counterproductive in this situation until the inflammation can be resolved. Finally, Karen sights that “an incorrect Kegel is “bearing down” or pushing the muscles towards the vaginal and rectal openings which puts undue stress on the pelvic organs pushing them further south.” Not a good idea. There are two excellent reasons to seek out a pelvic floor therapist before you begin this kind of exercise or training. The pelvis is tricky sensation wise and as a result it is challenging for a lay person to determine from where pain is truly originating and thus its cause. Also, many of us are so unfamiliar with our pelvic anatomy, going to a pro is simply a smart pelvic health strategy. A woman who consulted with me blamed recurring yeast infections for her pain. Turns out, after recommending she visit a Urogynecologist, she has a hypertonic pelvic floor. Moral of the story, please don’t self-diagnose. Seek out a trained pelvic health professional to be your compassionate guide to comfort and high quality of life. Comment or leave questions below we can answer for you! *Karen Liberi MS, MPT, WCS. Karen is one of only 300 physical therapists in the US with the designation of Women’s Health Clinical Specialists. She is a compassionate physical therapist who helps women with bladder and bowel concerns, pelvic pain, abdominal pain and sexual dysfunction. She and her team are known to successfully help people who have tried everything and almost given up.